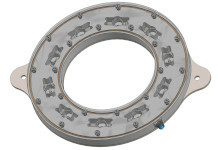 This 8.5” ring light, designed for washdown environments, is IP68 compliant. Its enclosure is constructed of FDA compliant materials, including 316 stainless steel and white delrin. All gaskets are either FDA compliant silicone rubber or white nitril. This light has been hydrostatic tested. Monster Washdown Ring Light is shipped with LDM700 driver, light and 4 meter cable. Window: Clear Window options: White diffuser. Cable Length: 4.0 m (13.1 ft) Optional 8, 15 and 30 meter standard cables.